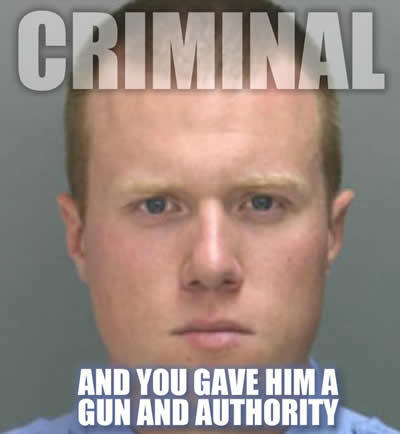 Officer Kevin Robinson is one of many Philadelphia Police officers who found their way into a uniform with a badge and gun. 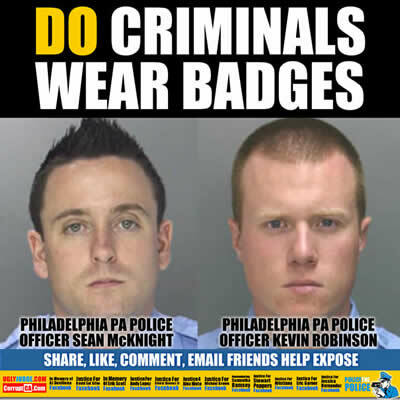 Acting above the law they brutalize, abuse and victimize the public with no accountability. Two city police officers were arrested Thursday and accused of knocking a man off a scooter and beating him so severely that another officer thought he had been shot. Officers Sean McKnight, 30, and Kevin Robinson, 26, were immediately suspended for 30 days and will likely be fired, Police Commissioner Charles Ramsey said. The pair had been off the street while a grand jury investigated. Ramsey said the officers acted improperly and in total violation of department training. “No one, not even police officers, is above the law,” District Attorney Seth Williams said as a video screen showed Najee Rivera’s beaten, swollen face. The officers lied to their colleagues and superiors about the May 2013 encounter in North Philadelphia by casting Rivera as the antagonist and charging him with aggravated assault and resisting arrest, Ramsey and Williams said. After Rivera’s arrest, his girlfriend went to the area and found surveillance footage of his encounter with the officers. The video shows the officers slamming him against a wall and beating him on the ground, said Rivera’s attorney Leo Flynn. According to Williams, the officers originally told the police department a different story on what happened next, one which a grand jury found to be fictitious. Robinson and McKnight said Rivera was injured after falling off his scooter and hitting the pavement. In the officers’ story, they said Rivera resisted arrest, tried to grab a police baton, and that’s when one of the officers hit him in the face. Police charged Rivera with resisting arrest and aggravated assault. However, prior to the case going to court, a surveillance video emerged from a nearby store. Watch video below as two officers commit assault with a deadly weapon (using their car to hit the victim), then assault and beat the victim. After which they lie and fabricate a story making them out to be the victims.